Most UTIs are successfully treated with commonly used drugs, dosages, and administration intervals. However, infections can be challenging to effectively treat when they involve the kidneys (pyelonephritis) and prostate (prostatitis). In addition, it can be difficult to create an appropriate antibiotic prescription in patients with kidney disease due to reduced drug clearance. Understanding drug pharmacokinetics (PK) and pharmacodynamics (PD) is essential when determining the most effective antibiotic therapy. In addition, successful antimicrobial therapy requires appropriate choice of antibiotic, including dose, frequency, and duration (Figure 1). Nearly all infections are caused by pathogenic bacteria, although fungal or viral UTIs may be rarely encountered. Most bacterial lower UTIs result from bacteria ascending the external genitalia and urethra. Less commonly, bacteria travel hematogenously and colonize the urinary tract. Numerous innate defense mechanisms help prevent a UTI. Complete and regular voiding, along with intrinsic properties of urine (high osmolality, antimicrobial solutes), helps create a hostile environment for microbes within the urinary tract. Anatomic barriers and mucosal defenses further prevent adherence of virulent bacteria to the urothelium. Pathogenic bacteria increase the permeability of the urothelium, allowing passage of inflammatory solutes into the subepithelium as well as inflammatory cytokine secretion.2 The result is inflammation and pain, which manifest as dysuria, pollakiuria, stranguria, and/or hematuria. Eradication of the virulent organism can allow the normal permeability and integrity of the urothelium to be restored. Recurrent UTI requires investigation to determine whether it is reinfection, relapsing, or refractory. Reinfection is the return of a UTI—caused by a different organism—within 6 months of discontinuation of antibiotic therapy. Relapsing UTI occurs when the same organism is cultured again within 6 months of discontinuation of antibiotic therapy. This suggests that the patient has a condition that allows recolonization or one that prevents total eradication of infection; additional diagnostics are warranted in these patients (Table 1). Additionally, some drugs may show efficacy in vitro, but, for unknown reasons, the same effect is not present in vivo. PK is the movement of a drug throughout the body and includes absorption, distribution, metabolism, and excretion. PD is the effect of the drug on the body; in the case of antibiotics, this also includes the effect on the microorganism. These relationships, often referred to as PK/PD, help predict the outcome of any drug prescription. Alterations in PK may happen with abnormal absorption (eg, severe gastrointestinal disease), drug metabolism (eg, synthetic liver dysfunction), altered protein binding (eg, uremia, hypoproteinemia), and diminished drug excretion (hepatic or kidney failure). An antibiotic’s PD is assessed clinically through in vitro culture and susceptibility testing. Ideally, all patients with a suspected UTI should have a urine sample collected via cystocentesis and evaluated by aerobic culture and antibiotic susceptibility testing. Urine culture is considered the gold standard in the diagnosis of UTI. The 2 techniques for determining antibiotic susceptibility are the disk diffusion and serial dilution methods. Disk diffusion testing is considered less reliable and does not provide the minimum inhibitory concentration (MIC) of the antibiotic, whereas antimicrobial dilution does provide the MIC and is the preferred method of antibiotic susceptibility testing. With antimicrobial dilution, a concentration of an antibiotic is added to a liquid medium inoculated with the bacterial isolate. The concentration of antibiotic is doubled in each subsequent well. The MIC is the concentration of antibiotic found in the first tube that exhibits no detectable growth,5 and this concentration is used to categorize the isolate as susceptible, intermediate, or resistant (see CLSI Classification). Rarely, false-negative findings may result from inappropriate urine storage or slow organism growth (as seen with Corynebacterium species). Urine processing for quantitative culture should be performed immediately after urine is obtained because bacterial colony count dramatically drops after 24 hours of refrigerated storage when urine is stored in a silicone clot tube.6 If urine cannot be processed for quantitative culture immediately, use of a urine transport tube is recommended to help prevent false-negative or underestimated colony count results. Isolate classifications—susceptible, intermediate, or resistant—are established by the Clinical Laboratory Standards Institute (CLSI) on the basis of drug PK and PD data. Several factors are considered in the establishment of CLSI breakpoint classifications. The peak drug concentration (Cmax) obtained by a standard dose and normal route of administration must be higher than the isolate’s minimum inhibitory concentration (MIC) for the isolate to be labeled susceptible. The Cmax is not always based on the drug concentration in urine. 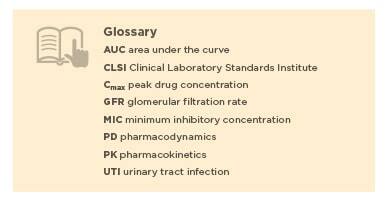 Some drugs have established CLSI breakpoints for UTI in some bacterial species (see CLSI publication VET01S); other breakpoints are based on infection in other organ systems or are even extrapolated from human use. All of the preceding factors should be considered in selecting the most appropriate drug, as well as dosage and frequency of administration. Many antibiotics are excreted primarily in urine and achieve concentrations substantially higher than those in plasma. The urine drug concentration should be evaluated with respect to the isolate’s MIC to determine the likelihood of eliminating the organism. Table 2 lists observed urine concentration of antibiotics at the specified dosages in healthy animals. Urine antibiotic concentrations in veterinary patients with kidney disease have yet to be investigated. Reduced glomerular filtration rate (GFR) may decrease the excretion of the drug into urine, resulting in decreased urine concentrations. Additionally, polyuric patients may experience further reduction of urine drug concentration because of increased daily urine volume and subsequent dilution of filtered antibiotic. Decreased urine excretion caused by diminished GFR can result in plasma drug concentrations exceeding those normally observed and may cause adverse effects. This is most true for drugs with significant kidney elimination. Drugs with mostly hepatic elimination may have minimal alteration in drug excretion in patients with decreased GFR. However, the accumulated uremic toxins and hypoproteinemia present in many patients with kidney disease can lead to altered drug protein binding and abnormal drug PK/PD. The protein binding and lipid solubility of an antibiotic help determine its volume of distribution. Highly lipophilic drugs cross cell membranes and enter tissues easily. Such drugs are most effective in treating prostatitis, in which the blood–prostate barrier prevents passage of many water-soluble antibiotics (such as beta-lactams). In early stages of prostatitis, the blood–prostate barrier may be compromised, allowing delivery of water-soluble antibiotics to the site of infection. However, after the initial inflammation resolves (1–2 weeks, based on my clinical experience), this barrier is restored and these antibiotics may no longer reach effective tissue concentration within the prostate, preventing bacterial cure. The lipophilic drugs that achieve effective concentrations within the prostate include fluoroquinolones, sulfonamides, and macrolides; however, choice of antibiotic should be based on urine culture and susceptibility results. To best use antibiotic urine data, an important consideration is whether a drug is time- or concentration-dependent. Experimental studies in rats have shown that the time for which the plasma drug concentration exceeds the isolate’s MIC correlates to the magnitude of bacterial colony count reduction; the longer the time for which the drug concentration remained above the MIC, the lower the urine colony counts.12 Successful eradication of bacteria within the renal parenchyma or urinary bladder wall is correlated to the plasma, not urine, drug concentration. When prescribing time-dependent antibiotics, shortening the interval between drug administration is the most effective method to allow the tissue/urine drug concentration to exceed the MIC for the majority of the dosing interval. Drug elimination follows first-order kinetics, where 50% of the drug is lost in 1 half-life. In contrast, doubling the dose would only add 1 half-life to the dosing interval. To add 2 half-lives to the dosing interval, the initial dose would have to be increased 4-fold. The peak serum drug concentration achieved by this approach may exceed the window of safety, producing adverse drug effects. For example, amoxicillin could be administered to dogs at a dosage of 10 to 20 mg/kg q12h; however, to maintain higher drug concentrations, the same dose could be administered q8h. One method to ensure that the tissue or plasma drug concentration consistently exceeds the MIC is to deliver the antibiotic as a continuous IV infusion. This may be particularly useful in critically ill animals, such as those with urosepsis or those that have an impaired immune response. The efficacy of concentration-dependent antibiotics is best predicted by the Cmax and the isolate’s MIC. Such drugs as fluoroquinolones and aminoglycosides are most effective when the Cmax is at least 8- to 10-fold higher than the MIC.13 These drugs are typically administered every 24 hours. The dosage of these antibiotics is typically chosen to create a high peak urine concentration, well above the isolate’s MIC. Once-daily administration is acceptable for most concentration-dependent drugs, and this frequency may help increase owner compliance in administering medications. However, it may not be consistent with antibiotic stewardship to prescribe a fluoroquinolone antibiotic for an uncomplicated lower UTI when drugs belonging to the penicillin or cephalosporin class would also be effective. 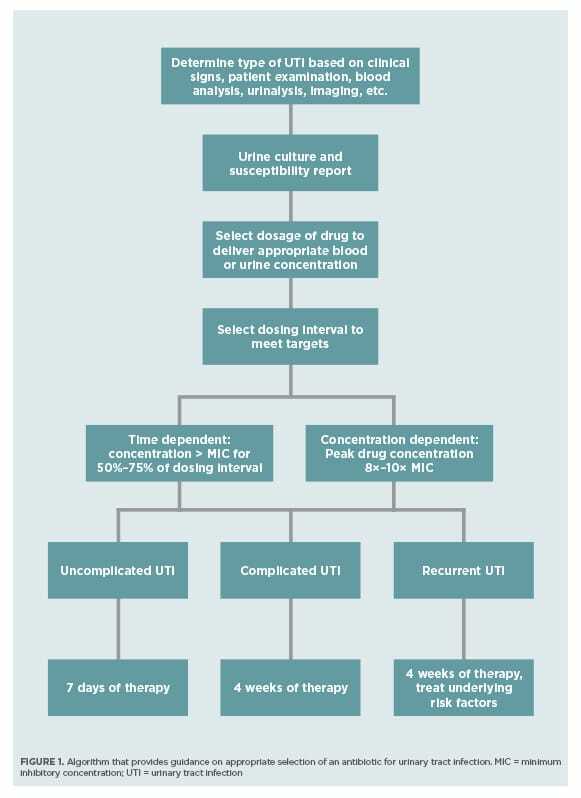 The ideal duration of antibiotic therapy for uncomplicated and complicated UTI is unknown. 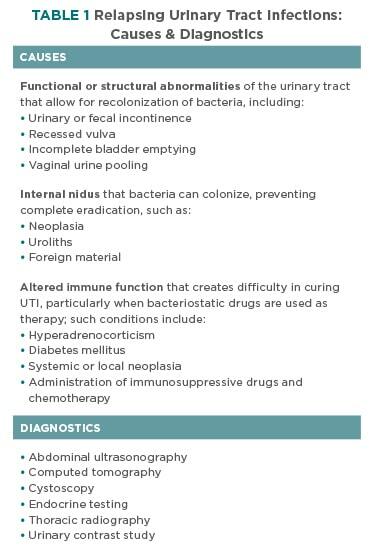 Many textbooks recommend 10 to 14 days for uncomplicated UTI and 4 to 8 weeks for complicated UTI; however, these guidelines are not evidence-based, and much shorter durations are the standard of care in human medicine. In 2011, the International Society for Companion Animal Infectious Diseases published recommendations regarding antimicrobial therapy in UTI.3 The recommendations mostly reflect expert consensus because well-designed clinical trials to determine optimal antibiotic duration are lacking in veterinary medicine. For uncomplicated UTI, this group recommended 7 or fewer days of antibiotic therapy; humans are typically treated for 3 to 7 days. For complicated UTI, the group recommended antibiotic therapy for up to 4 weeks; humans are typically treated for 1 to 2 weeks, although 3 weeks may be indicated in some instances. A systematic literature review conducted in 2015 to determine the optimal therapy for UTI in veterinary medicine found insufficient evidence available for analysis.19 Currently, evidence-based guidelines for the duration of UTI in small animals do not exist, and further studies evaluating a single drug in both short and long durations of therapy are needed. Recheck urine culture 5 to 7 days into antibiotic therapy. This confirms that the prescribed dose and frequency of the drug were successful in treating the organism isolated. This culture also may reveal an additional isolate that could not be identified in the initial culture. Any bacterial growth observed at this time suggests treatment failure. Reconsider the choice of antibiotic, dose, and administration frequency. Recheck urine culture 3 days before discontinuing antibiotic therapy. This is an optional step, but it confirms that, when therapy was discontinued, the patient still had a negative culture. Positive bacterial growth at this stage suggests a refractory infection or newly inoculated organism. Investigate patients for any nidus of infection (eg, urolithiasis, anatomic abnormality, local neoplasia). Alter treatment and institute new therapy for the same duration as previously intended. Recheck urine culture 7 days after discontinuing antibiotic therapy. Positive growth should prompt investigation for causes of relapse or reinfection. Complicated, relapsing, recurrent, and refractory UTI may be challenging to cure. However, understanding drug PK/PD and potential alterations in the animal’s metabolism/excretion of the drug can help increase the likelihood of successful treatment. Guidelines for appropriate antibiotic dosing for animals with kidney disease have not been established; therefore, a working knowledge of pharmacology and the prescribed drug’s PK/PD profile is needed to help create a successful antibiotic prescription with the smallest risk for adverse effects. When possible, in patients with kidney disease, avoid drugs that have a narrow margin of safety and undergo significant renal elimination (eg, fluoroquinolones in cats, aminoglycosides) and then choose alternative drugs (based on susceptibility results) that undergo hepatic elimination or those with a wide margin of safety. The International Society for Companion Animal Infectious Diseases (ISCAID) Antimicrobial Working Group Guidelines for Treatment of Urinary Tract Infections are available at iscaid.org/wp-content/uploads/2013/10/Urinary-guidelines.pdf. Kivistö AK, Vasenius H, Sandholm M. Canine bacteruria. J Small Anim Pract 1977; 18(11):707-712. Wood MW, Breitschwerdt EB, Nordone SK, et al. Uropathogenic E coli promote a paracellular urothelial barrier defect characterized by altered tight junction integrity, epithelial cell sloughing and cytokine release. J Comp Pathol 2012; 147(1):11-19. Weese JS, Blondeau JM, Boothe D, et al. Antimicrobial use guidelines for treatment of urinary tract disease in dogs and cats: Antimicrobial guidelines working group of the international society for companion animal infectious diseases. Vet Med Int 2011; 2011(4):1-9. Wong C, Epstein SE, Westropp JL. Antimicrobial susceptibility patterns in urinary tract infections in dogs (2010-2013). J Vet Inter Med 2015; 29(4):1045-1052. Boothe DM. Principles of antimicrobial therapy. Vet Clin North Am Small Anim Pract 2006; 36(5):1003-1047-vi. Patterson CA, Bishop MA, Pack JD, et al. Effects of processing delay, temperature, and transport tube type on results of quantitative bacterial culture of canine urine. JAVMA 2016; 248(2):183-187. Smee N, Loyd K, Grauer GF. UTIs in small animal patients: Part 2: Diagnosis, treatment, and complications. JAAHA 2013; 49(2):83-94. Ling GV. Therapeutic strategies involving antimicrobial treatment of the canine urinary tract. JAVMA 1984; 185(10):1162-1164. Dowling PM. 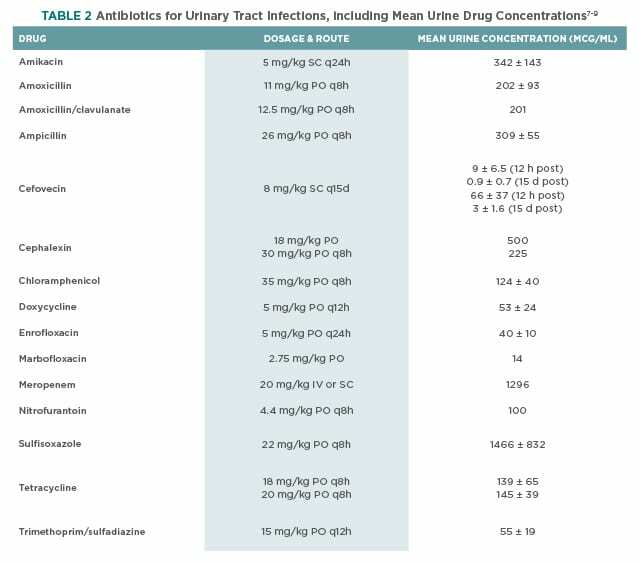 Antimicrobial therapy of urinary tract infections. Can Vet J 1996; 37(7):438-441. Toutain PL, del Castillo JRE, Bousquet Mélou A. The pharmacokinetic-pharmacodynamic approach to a rational dosage regimen for antibiotics. Res Vet Sci 2002; 73(2):105-114. Toma S, Colombo S, Cornegliani L, et al. Efficacy and tolerability of once-daily cephalexin in canine superficial pyoderma: An open controlled study. J Small Anim Pract 2008; 49(8):384-391. Frimodt-Møller N. Correlation between pharmacokinetic/pharmacodynamic parameters and efficacy for antibiotics in the treatment of urinary tract infection. Int J Antimicrob Agents 2002; 19(6):546-553. McKinnon PS, Davis SL. Pharmacokinetic and pharmacodynamic issues in the treatment of bacterial infectious diseases. Eur J Clin Microbiol Infect Dis 2004; 23(4):271-288. Gebru E, Choi MJ, Lee SJ, et al. Mutant-prevention concentration and mechanism of resistance in clinical isolates and enrofloxacin/marbofloxacin-selected mutants of Escherichia coli of canine origin. J Med Microbiol 2011; 60(Pt 10):1512-1522. Schentag JJ. Clinical pharmacology of the fluoroquinolones: Studies in human dynamic/kinetic models. Clin Infect Dis 2000; 31 Suppl 2:S40-S44. Liu H, Mulholland SG. Appropriate antibiotic treatment of genitourinary infections in hospitalized patients. Am J Med 2005; 118(7):14-20. Clare S, Hartmann FA, Jooss M, et al. Short- and long-term cure rates of short-duration trimethoprim-sulfamethoxazole treatment in female dogs with uncomplicated bacterial cystitis. J Vet Intern Med 2014; 28(3):818-826. Westropp JL, Sykes JE, Irom S, et al. Evaluation of the efficacy and safety of high dose short duration enrofloxacin treatment regimen for uncomplicated urinary tract infections in dogs. J Vet Intern Med 2012; 26(3):506-512. Jessen LR, Sørensen TM, Bjornvad CR, et al. Effect of antibiotic treatment in canine and feline urinary tract infections: A systematic review. Vet J 2015; 203(3):270-277. The lack of data and the limitations in well-designed studies prevent complete evidence-based guidelines from being described for treatment of urinary tract infection (UTI). This article presents an approachable and logical process for treating UTI; however, it too lacks clinical validation. The usefulness of urine drug concentrations has been debated, but several textbooks and peer-reviewed manuscripts suggest that these concentrations can play a role in creating a valid antimicrobial drug prescription. In addition, while the clinical success of drug therapy cannot be predicted on urine drug concentration alone, in the absence of individual patient drug therapeutic monitoring, glomerular filtration rate testing, and urine drug bactericidal assessment data, there are few hard facts on which to base therapy. This article focuses on relevant topics in drug pharmacokinetics/pharmacodynamics, urine susceptibility testing, and educated drug therapy, and numerous holes in our understanding prevent these topics from being without question or debate. However, I hope this article helps increase the understanding of drug pharmacology, where it pertains to UTI, to the best of our understanding. JD Foster, VMD, DACVIM, is a board-certified internist with clinical and research interests in nephrology and urology. He is the director of the Extracorporeal Therapies Service at Friendship Hospital for Animals in Washington, DC. His research interests include drug pharmacokinetics in renal disease, nontraditional uses of extracorporeal blood purification, acute kidney injury, and glomerulonephritis.